Institute of Banking Personnel Selection (IBPS) has issued the IBPS RRB Office Assistant Prelims 2016 Score Card at ibps.in. Candidates can check their scores via official website till 18 December 2016. 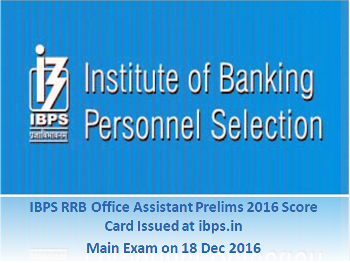 Institute of Banking Personnel Selection (IBPS) has issued the IBPS RRB Office Assistant Prelims 2016 Score Card at ibps.in. The score card is issued on the basis of IBPS RRB V Office Assistant Prelims 2016 Exam held on 12 November 2016, 13 November 2016 and 19 November 2016 for recruitment to 5539 posts of Office Assistant (Multipurpose). Candidates can check their scores via official website till 18 December 2016. The number of vacant posts for Office Assistant (Multipurpose) is vast for which lakhs of candidates had applied. The next round for IBPS RRB Office Assistant recruitment is IBPS RRB Office Assistant Main Exam 2016 which is scheduled to be conducted on 18 December 2016. The Main Exam scheduled will decide the prosperous future of many candidates. Candidates who were eagerly waiting for Office Assistant Prelims 2016 score card can now check the same at ibps.in. To view the score card, candidates are required to use their registration number/ roll number and date of birth. As the score card is now issued for IBPS RRB Office Assistant Prelims 2016, candidates will be able to gauge the score and accordingly will be able to figure out more about the IBPS RRB Office Assistant Main Examination 2016. To appear in the IBPS Office Assistant Main Exam candidates are advised to regularly visit the official website i.e., ibps.in for updates. The IBPS RRB Office Assistant Main Exam will be conducted online and candidates are required to produce all documents/ call letter without any exception at the time of Main Examination. The marks which the candidate will score in Office Assistant (Multipurpose) Main Exam 2016 will be considered for short listing for final merit listing. Therefore, the final phase of IBPS RRB Office Assistant (Multipurpose) 2016 recruitment is round the corner. Candidates are advised to give their best effort in qualifying the overall selection procedure and be a part in succeeding the most popular competitive banking exam.